Brewing requires large amounts of heat, water and malted grain. All of these components are necessary for growing yeast which turns natural sugars into alcohol. In a brewery, yeast is a beneficial fungus, however, if ambient humidity levels remain unchecked, microbes and fungus may grow in its place and disrupt the brewing process. Hygiene is an inherent problem in any brewery or distillery. The growth of mold and fungus on walls, in the hops storage area and in the fermentation and yeast rooms is caused by one common factor…humidity. The brewing process requires very low temperatures which can result in condensation on the tanks and vats containing the beer. In addition, the presence of high humidity, due to frequent water usage for cleaning, make conditions perfect for condensation and growth of bacteria. Desiccant dehumidification can eliminate organic corrosion, mold, mildew and fungus in yeast rooms, fermentation rooms, storage facilities and kegging areas. Other benefits of dehumidification include improved sanitary conditions, reduced maintenance costs, frost-free operation and quicker drying of floors after washing. Heineken, the Dutch beer brewer, is famous all over the world and needs no introduction. Maintaining high quality in all aspects of the production of beer is of prime importance to all Heineken employees. 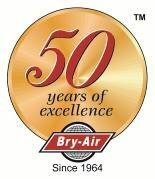 So when they had problems with condensation, bacteria and sanitary conditions within their production area, they contacted Bry-Air, Inc. The total moisture load at a temperature of 35°F was 224 pounds of water removal per hour. 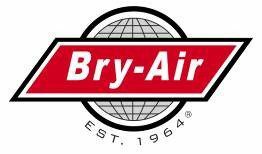 To remove this quantity of water a Bry-Air, Inc. Model MVB-200-FS was selected with a nominal airflow of slightly over 20,000 cfm. The energy source for the reactivation was steam and an air-to-air heat recovery coil was included for additional energy savings. The dehumidifier was installed on the roof of a six floor production building in a sheet-metal housing. From there, the dry air was distributed to each of the six floors and the basement area. The return air from the production areas was re-circulated through the dryer and dried on a continuous basis. Heineken solved their hygiene problems and continued to produce one of the world’s highest quality beers, and millions of Heineken drinkers everywhere can look forward to an ample supply of their favorite beer.